Surfing in the Pacific Ocean, active volcanoes, beaches of black sand, snowy mountain ranges - in the new aerial video Timelab Pro discovers winter Kamchatka. 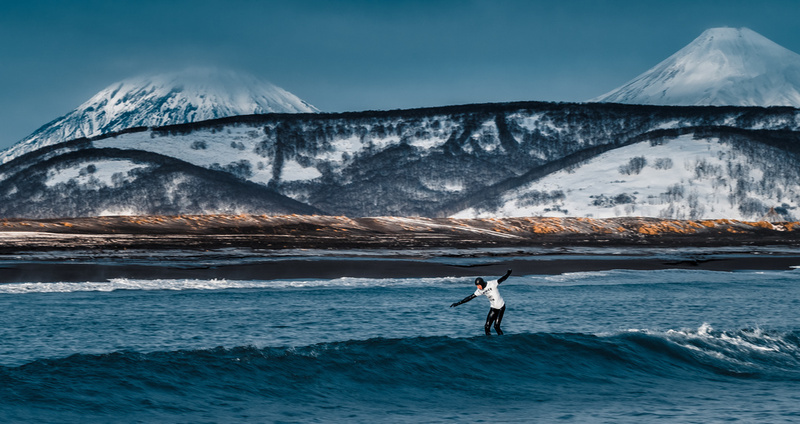 In January 2018 on the peninsula on the coast of the Gulf of Avach Russia's unique winter surfing contest took place - the Winter Surf Challenge. Our film crew did not hit the waves, but had the pleasure to shoot the contestants facing the force of nature. Part of the filming happened at nighttime, outside the main event, which was limited in time while the waves were not always suitable for surfing. The freezing -15°C and winds that knock you off your feet didn't stop the surfers conquering the waves in the light of three cars' headlights. Besides the contest, the video features footage from our trip around Kamchatka. The opening shots show the eruption of the Klyuchevskaya Sopka volcano - we filmed it early in the morning, when the ashes were highlighted by the first beams of the sunrise. You can also see the Parantuka river, which never freezes, and the Vilyuchinsky pass from the above.